I’m pleased to announce that I’m a co-editor for a forthcoming book on visual practice! The book is The Visual Facilitation Field Guide. The other co-editors are Jeroen Blijsie of The Visual Connection (the Netherlands) and Tim Hamons of Art of Awakening (Singapore). The book’s design is provided by Visuality (Belgium). The Field Guide is intended for visual practitioners to use as a sourcebook of ideas and inspiration, but it’s also intended for non-practitioners to get a sense of the depth and breadth of the field and understand why and how to partner with a visual practitioner. 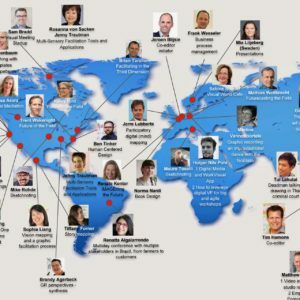 Over 50 co-authors, all visual practitioners or facilitators who partner with them, from all over the globe are contributing chapters about their own experiences and methods. It’s been an interesting process so far — coordinating the chapter contents, working with the co-authors, and gradually seeing the book take shape. Most of the work is being done virtually, which is one of the reasons I was interested in the project to begin with. There’s a great write-up of our synchronous Book Sprint from The Grove that gives a feel for how we kicked the project off. The Field Guide reflects the experience and interests of its diverse co-authors. It includes sections on visual language and drawing, visual facilitation basics, roles, listening, dialog, templates, meetings–including large-scale meetings–both face-to-face and virtual, team performance, storytelling, working off the paper and beyond the meeting, and intersections with other fields. There’s also a section of stories using visuals in action and a section about the future of the field. The book is being self-published and will be available this summer (2018). To cover the costs, we’re launching a Kickstarter campaign! The campaign opens on April 24, 12.00 PM CET, when you’ll be able to pre-order the book at a deep early bird discount. Or you can pledge a higher amount for other rewards, like a one-on-one coaching session with David Sibbet (The Grove) or Brandy Agerbeck! The Kickstarter campaign is open! I’ll be posting updates on Facebook and Twitter as the campaign gets closer. Stay tuned!